Suresh Kumar, former assistant U.S. secretary of commerce and director general of the U.S. and Foreign Commercial Service, will share his thoughts on public service and global engagement as Executive-in-Residence at the Longwood University College of Business and Economics. Kumar's day with students will be capped off with a public presentation on Monday, Nov. 4, at 7 p.m. in Longwood University's Wygal Hall. He has led business initiatives in every continent, has lived in six countries and speaks six languages, and has published on globalization and management practices. Suresh Kumar, who formerly led U.S. trade promotion and export efforts in the Obama administration, will speak Monday, Nov. 4, at 7 p.m. in Longwood University’s Wygal Auditorium. His talk, exploring public service and global engagement, is part of the Executive-in-Residence lecture series in the College of Business and Economics. 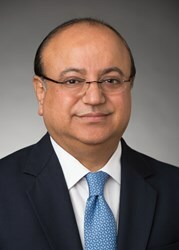 Kumar served as assistant U.S. secretary of commerce and director general of the U.S. and Foreign Commercial Service from February 2010, when he was appointed by President Obama, until this March when he joined Oliver Wyman, an international management consulting firm. He has spent more than 30 years as an international businessman, consultant and professor of management. Before joining the Obama administration, Kumar was president and managing partner of KaiZen Innovation, a management consulting firm that he founded in 2004. At KaiZen, he consulted for several organizations including the Bill & Melinda Gates Foundation and the Clinton Foundation, in which he worked on food security and economic development projects in Sub-Saharan Africa. Kumar, based in New York City, is a partner in Oliver Wyman’s Health & Life Sciences and Public Sector practice groups. He has led business initiatives in every continent, has lived in six countries and speaks six languages, and has published on globalization and management practices.